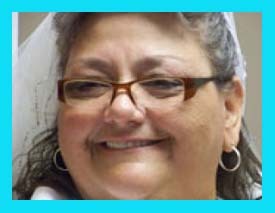 Jeannie "SueBear" Spicer Gering, went to be with the Lord on September 12, 2011 at Integris Baptist Regional Medical Center. She was 59. Mrs. Gering was born August 12, 1952 in Miami, Oklahoma to Christopher and Joan (Nichols) Spicer. She graduated Commerce High School in 1970. She lived in the Miami area all her life. SueBear was activities director at Eastwood Manor in Commerce, but was so much more than just that she was a caregiver who went above and beyond the call of duty in her everyday life as well. She would often set at the bedside of those passing from this life to be with the Lord who had no family, just so they didn't have to pass alone, in the 20 years of her service there were several. She was a member of the Seneca-Cayuga Tribe and The Quapaw First Freewill Baptist Church. She is preceded in death by her parents; first husband, Ricky Bear; second husband, Richie Gering; and one brother Bernie Gamble. Survivors include one brother, Paul Spicer and his wife Mary of Miami, OK; one son, Josh Bear of Miami, OK and his father Carl Greenfeather; one daughter, Cathy and her husband David Hayworth of Chelsea, OK; one grandson, Tristin Bear of Chelsea, OK; and one blessed grandson expected in December. Sue cherished close relationships with numerous step children, step-grandchildren, and step-great-grandchildren. She loved to help people and anyone she could help even after her death by giving to Life Share. Services will be 10 a.m., Thursday, September 15, 2011 at the Paul Thomas Funeral Home of Miami, Oklahoma with Pastor Robert Nutting, Rev. Geoff Buffalo and Bro. Ray Clonts officiating. Honorary pallbearers will be SueBear's grandsons. Professional services under the direction of the Paul Thomas Funeral Home of Miami.